Old fort 13 historical guest rooms, situated in the original Old Fort-Palace, offer guests an exclusive and authentic cultural experience. Garden House 7 conventional guest rooms with modern amenities are situated in the Garden House, a new construction using traditional materials and building techniques in keeping with the historical architecture of Shigar Fort. The Garden House guest rooms offer intimate terraces and views on the Amacha Garden . Each room has been decorated tastefully, with handmade textiles and antique objects. These rooms offer good value and spacious comfortable accommodation. 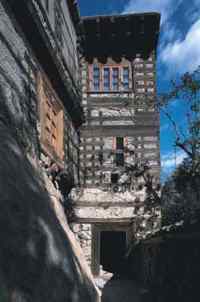 Shigar Fort Residense in Skardu, offers above rates only to Hunza tours. The online reservation payment must be made to Hunza tours not the hotel. Book your events, Meetings, Conferences Marriage parties at Shigar Fort Residense or any other hotel in Skardu please feel free to email us we will offer you the best possible rates and perfect arrangements to suit your events. For room reservations at Shigar Fort Residense Skardu please contact usTravel & Culture Services are hotel reservation agents in Pakistan. We reserve hotels at special discounted rates for individuals and companies.